Kuebix has made it simple to configure the ideal TMS for even the most complex supply chain with the launch of Premier Apps and Integrations. Logistics technology provider Kuebix today announced Kuebix® TMS with Premier Apps and Integrations. 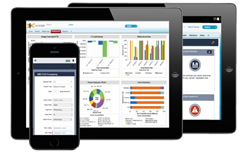 Kuebix TMS is a subscription transportation management system (TMS) built on Salesforce.com that is ready to use in minutes. For companies that require additional features or access to data, Kuebix has made it simple to configure the ideal TMS for even the most complex supply chain with the launch of Premier Apps and Integrations. Companies start with the core Kuebix TMS, a Software as a Service (SaaS) logistics solution that offers LTL, truckload and parcel shipment rating, booking and tracking, as well as invoice audit, claims management and carrier pay. Kuebix enables businesses to manage all their shipments on any mobile device using their direct carrier rates. In addition to shipment and financial management, the core Kuebix TMS offers Salesforce.com’s best-in-class customer relationship management system (CRM). Kuebix is available for a 30-day, no commitment free trial at http://www.kuebix.com. Kuebix provides a disruptive SaaS TMS built on the latest cloud technology that is changing how businesses purchase and manage freight. Kuebix TMS is the right solution for every company. For small to medium-size businesses, Kuebix offers a robust TMS that is ready to use in minutes. For larger companies and enterprises, Kuebix with Premier Apps & Integrations is the perfect solution for even the most complex supply chain. With Kuebix, companies only pay for what they need. And because Kuebix is a true cloud-based system, Premier Apps and Integrations are ready in a fraction of the time of other enterprise solutions. Finally, Kuebix offers Managed Services to businesses looking to partially or fully outsource transportation management.